I introduced Daisy not too long ago. I recently had the chance to review something cute and great for her. I have to say that I love it. Glamour Dog provided me with one of their pet carriers. 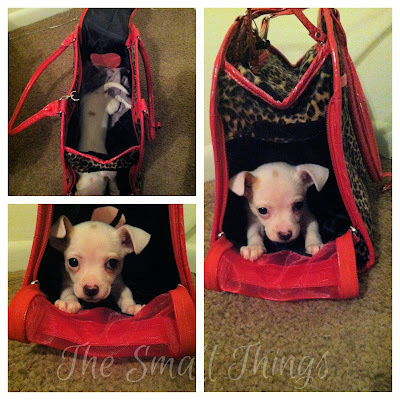 Let me tell you more about Glamour Dog before I show you this awesome carrier. GlamourDog began in 2001 as most businesses do with a proposal between our three original partners; Cynthia, Casey, and Chanel. This proposal, however, was a marriage proposal. Casey proposed to Cynthia on her birthday by giving her a toy maltese puppy named Chanel. On the nametag was inscribed “Will you marry me?”Casey, a graphic designer, and Cynthia, a fashion designer, decided to combine their talents and love for their puppy, Chanel by creating a store that was truly dedicated to spoiling your pampered pups with an exceptional flair for fashion. How sweet is this?? Their story is awesome! They have a ton of items on their website that I completely fell in love with! 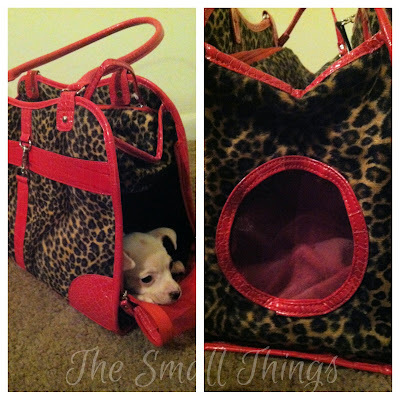 Glamour Dog has a variety of pet carriers to choose from but I fell in love with the Leopard Print Carrier. Daisy loves it too! She seems to gain attention from everyone in it! I love how easy that it is to get her into it. I also like the mesh paneling on it so that she can peek out and see what is going on. Overall, we recommend this pet carrier to anyone. It also comes in regular Leopard Print! Do you want one for yourself? Purchase it now on the Glamour Dog website for $59.99! Check out other products that they have to offer as well. You will fall in love with every bit of it. Be sure to follow Glamour Dog on Facebook and Twitter to stay up with the latest news too! Omigosh! That's TOO cute! Your dog is adorable too. I have a little pup that would fit in there and he'd love to be carried around. Such a mama's boy. Thanks for this review. I'll check these out for my dog, too! Almost makes me wish that my 61.5 pound pooch was a pocket pup! Oh my goodness this is so awesome. I would love to have one! I would love to have one of these, my Chloe would love it!! I think it is so cute!!! This is adorable. I don't have a dog small enough for it though.